It is possible to develop a coating agent that meets various needs. We develop original coating technology with ultra-high concentration, excellent storability, workability is not broken well, peeling-off coating agent. 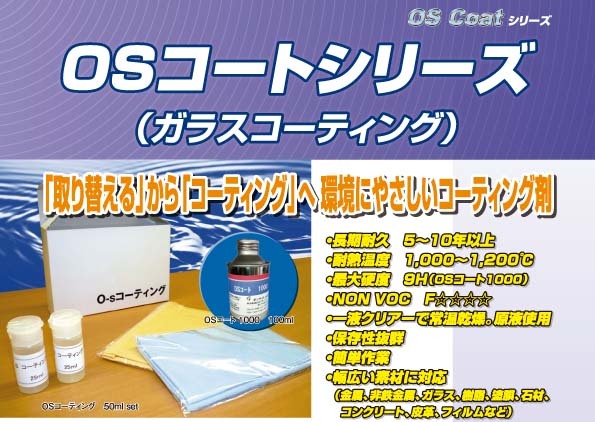 OS GC coat is an inorganic coat. It protects the material from ultraviolet rays and aging deterioration. Maximum altitude 9 H Heat resistant temperature 1,000 Durability above 10 years. Specialized for preventing stain adhesion which does not allow oil-based pen and lacquer spray. The work is very simple. Please see the movie below for work method and effect. Left side: Unprocessed water stains Right side: OSGC 4000 Granite color does not change. The movie is granite. Marble is the same effect. OSGC 5000 It can be used for undercoat of thin film, long-lasting rust prevention with one liquid, high rust preventive effect. OSGC 7000 automobile body coat, OEM manufacture. Based on various types we develop and manufacture special coating agent for customers. You can be satisfied not only in terms of performance but also in terms of cost. Various functions such as barnacle adhesion prevention, mildewproofing, UV absorption can be added. Excuse me. We can not respond to English phone calls. Copyright © 2019 オンサイト株式会社 All rights Reserved.